Europe’s biggest bike dealer network, Carnell-City, is responding to customer complaints by setting up a system that means none of the staff get to go home until all that days calls have been responded to. 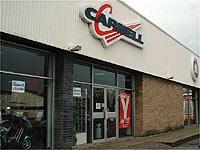 We’ve all heard stories of people calling Carnell-City branches, leaving messages and never hearing back. From August 1 all that stops. Each department will have a " Promise Pad " where ALL calls and ALL messages will be recorded. A statement from Carnell-City, says: " All promises of calls will be logged by day and nobody will leave for the eveing until every call is returned. MD David Morrow said: " To some people the Promise Pad may seem a bit of a gimmick and a pointless exercise. But we know how important it is to make the calls we promise to make, return any calls and reassure our customers that we take communication seriously. "